Many Georgians install irrigation systems to help maintain their landscapes. Price of the system is a very important consideration for many consumers, but this is not the only cost consumers should consider. Consumers also pay for the ongoing costs of water used by the system. Over time, these costs will exceed installation costs. A well-designed, properly installed, and efficient irrigation system will reduce water costs. The price of water is variable throughout Georgia, but like most prices, it goes up, not down. For example, between 2005 and 2012, the cost of water in Cobb County increased 333%, from $0.003/gal. to $0.01/gal. It is relatively easy for a customer to assess installation costs associated with an irrigation system. They are prominently displayed on the project bid. What can a potential customer determine about long-term water use from the project bid? Georgia irrigation contractors were asked to help answer this question. A “typical” residential landscape plan was created. Over 30 irrigation contractors were asked to bid on the plan. All contractors were instructed to provide a bid identical to that which they would provide a potential customer. 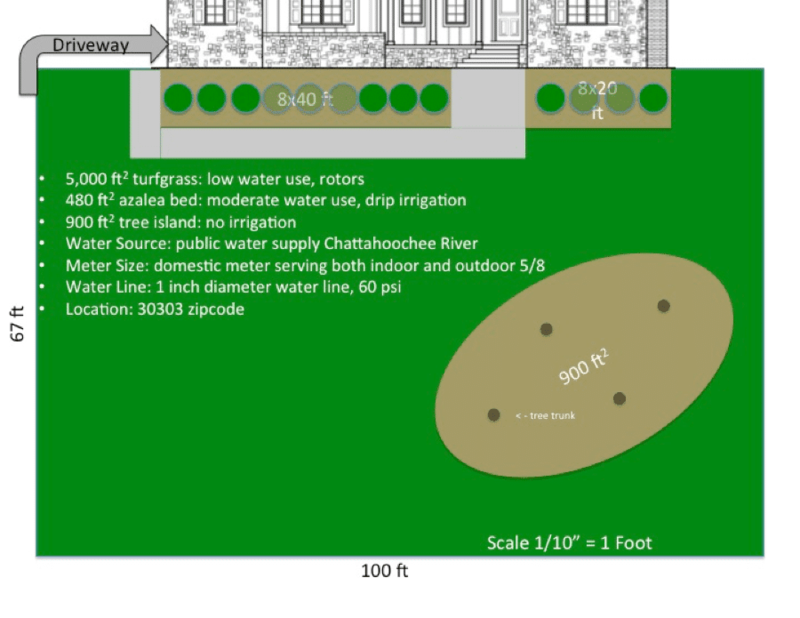 The landscape plan was designed meeting the specification of the WaterSense© (WS) Water Budget Tool (Figure 1). WS is a partnership program created by the US Environmental Protection Agency (EPA). It is intended to make water conservation easier by creating an easily identified brand for consumers to choose. Irrigation contractors may become WS partners. They must submit proof of certification through an accepted certifying program. Three certification programs from the Irrigation Association (IA) qualify: Irrigation Design, Irrigation Contractor, and Landscape Irrigation Auditor or Golf Irrigation Auditor. In addition individuals must agree to promote water efficiency to customers and provide water-efficient services to customers. It has been suggested that WS partners charge a premium for their service. The contractors asked to submit bids were located throughout the state of Georgia. WS partner irrigation contractors are listed on the EPA website and were contacted via telephone and email. Non-partners were referred by the leadership at Georgia Green Industry Association, irrigation distributors and other irrigation companies. Non-partners were contacted by telephone, email or by visiting their place of business. Five WS partners and six non-partners participated in this study, for a total of eleven contractors. Figure 1. All contractors presented a bid for this landscape plan and were provided the information included on this plan. Table 1. Summary of all bids received. 1This controller is WS compliant. 2 Previously certified. The bids ranged from a high of $3,480 to a low of $1,530 with an average bid price of $2,417. The content of the bids was also quite variable. Some contained considerable detail; others did not. Contrary to presumptions, WS partner bids, with an average cost of $2,297, were slightly less expensive than non-Partner bids ($2,517). As might be expected for increased professionalism, the seven IA certified contractors (average = $2,549) tended to charge more than the four, non-certified contractors (average = $2,188). No statistically significant differences were found among bids for WS partners and non-partners or certified and non-certified contractors. Some of the bids suggested practices that would increase water use. Two bids did not use drip irrigation on the azaleas. One of these contractors expressed concerns about increased maintenance associated with drip irrigation. Another bid watered the tree island, noting that installation would be less expensive if the tree island was watered with turfgrass areas. Another chose not to use a WS labeled controller. This contractor observed that a smart controller in the hands of an uneducated manager could waste more water than a simple controller with a rain shutoff devise. One contractor suggested eliminating the rain shutoff devise to save money (this is a violation of state law). Interestingly six contractors included a WS labeled smart controller in the bids. Only two of the WS Partners used WS compliant controllers. One bid provided no information about the controller and four bids provided no information about nozzles, heads or drip equipment. Only one bid provided water-saving equipment upgrades for the consumer. The bid did not specify that the upgrades would reduce water use. There was not enough information to assess the water use efficiency of all bids, but it was clear that high installation costs did not guarantee a water efficient system and low cost did not assure a system with high water use. Several contractors noted pressure to deliver a low-cost bid to consumers. However, installation costs are only a small part of what consumer pays for landscape irrigation. Ongoing water costs will quickly eclipse the cost of the installation. Contractors may be able to distinguish their bids and sell upgrades by addressing water costs in bids and conversation. The WS Budget tool estimated the water budget of the test landscape at 14,500 gal. at peak use in June. This low water use landscape assumed the use of a smart controller, drip irrigation on the azaleas in front of the home and no irrigation on the tree island. The WS program asserts that the test landscape would use 20% less water than an average landscape. Monthly water use was estimated using the Cobb County Water Consumption Curve for guidance. Water used by low and high efficiency systems was estimated. The Cobb County Water Consumption Curve indicates water use at 40% of June maximum in April, 80% in May, 100% in June, 100% in July, 90% in August, 80% in September and 60% in October (Table 2). One could argue with any of these assumptions, but they are all reasonable. Table 2. Estimated water use in gallons on the test landscape with a low water use and a high water use irrigation system. Both Cobb Co. and the City of Atlanta have water consumption cost calculators available online. Cobb Co. has relatively low water costs and Atlanta has high costs. Two additional assumptions were made. First that there was no irrigation meter on the test landscape and second, that water costs would not increase in the next 10 years. The first assumption is reasonable, given the small size of the landscape. The second assumption (no increase in water cost) is unlikely. Even with a low water use system and Cobb County’s low water rates, the cost of the water exceeds the average cost of the system installation by the third year (Table 3). In Atlanta the cost of water approached the cost on the installation after the first year and exceeds the average cost of two installations by the third year. With a high water use system, the consumer may spend as much as $27,000 in water over a 10 year period! Table 3. Comparison of costs associated low water use and high water use irrigation systems as described in Table 2. This assumes no increase in water rates over the 10-year period. When the cost of water is considered, the customer may be quite willing to upgrade the system. Clearly, it is easier for homeowners to assess the cost of the irrigation installation than it is for them to assess the cost of future water use. However, armed with estimated water costs, it might be fairly easy to sell more expensive and water efficient systems to consumers. It simply makes no sense to save money on the installation only to spend those savings and more on unneeded water. EPA WaterSense. 2013. Version 1.1 WaterSense New Home Specification. EPA WaterSense. 2013. Interactive Water Budget Tool.